A cigarette lighter… or a hidden video camera? Fortunately for public health, the total figures of smokers worldwide are slowly but constantly decreasing, thanks to several kinds of campaigns, but also to the increasing level of access to information about the damages caused by the smoking habit. In spite of this, one does not necessarily have to be a smoker to carry a cigarette pack or a lighter in the front pocket of his coat or jacket, especially if he is working as a private detective or a police agent, and the cigarette pack actually contains a miniaturized digital video recorder. Within the size of a normal cigarette lighter, which can aptly be hidden inside a cigarette pack, it is a real professional system to shoot hours and hours of covert video footage in digital format. 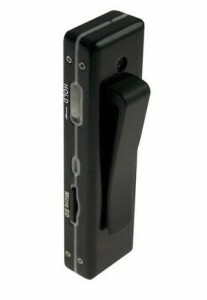 In fact, aside from being equipped with an embedded needle pin camera, capable of recording high quality video with a 176×144 resolution, it also houses a Micro SD memory card of up to 2 Gb, where it can store up to 37 hours of movies, which you can comfortably download on your PC thanks to its USB plug, or by just removing the memory card. Once the footage is downloaded on your PC, you will be able to scan it for evidence that you can use for your investigations, and use them before a court of law if necessary. The recorder is powered by a rechargeable lithium battery, which allows for 2 hours of continuous recording. Video recording is started with one simple button, so you will not have to struggle (at the risk of being exposed) to start your recorder, and you can just pin the camera on your front pocket as if it were a lighter, and not a professional video recorder!